the Japanese word (Rei) which means “Universal Life” and (Ki) which means “Energy”. Imbalance in our daily lives, toxins and stress affect our energy centers, often causing blockages in our chakras. Chakras are energy centers within the human body that help to regulate all of its processes...organ function...immune system...and emotions. There are seven chakras in the body, each with its own vibrational frequency, that is depicted through a specific chakra color, and governs specific functions. Reiki gets the energy moving to break up blockages and assists to bring the chakras into alignment and balance to create harmony. As a reiki practitioner, my intention is to bring you holistic healing, health and peace through this beautiful, spiritually guided life force energy. From ancient Egypt to modern times, essential oils have long been recognized for their healing properties and therapeutic benefits. 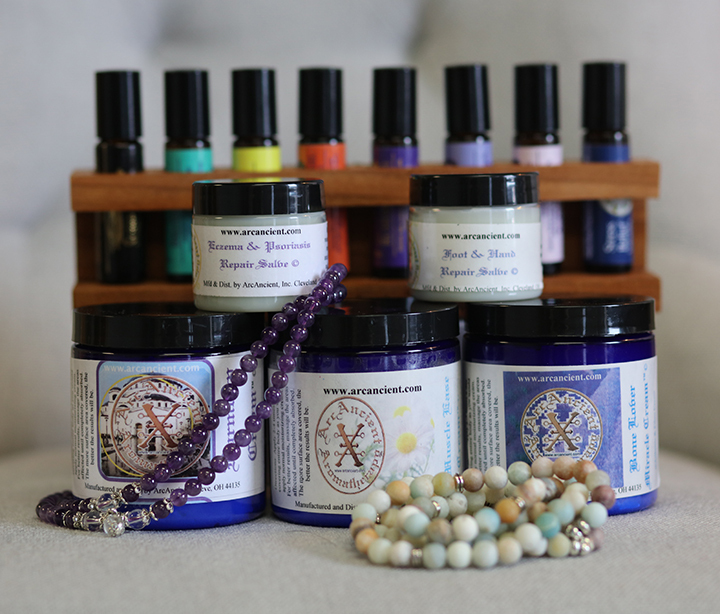 Through our partnership with Arc Ancient Aromatherapy, we integrate and sell essential oils, blends and creams. Ancient civilizations have used healing crystals to release mental, physical and spiritual blockages. Silicon dioxide (silica) is a natural compound found in both quartz crystals and in the tissues of the human body. Because of this, we are naturally receptive to the vibrations of crystals as they generate, store, regulate, transmit and absorb energy. When placed on the body, they have a powerful vibratory effect that surges from the crystal to you. Through guided intuition we may integrate the use of healing crystals during your reiki session. We also carry a large selection of crystals and gemstones available for purchase.